The DPF component suite for Android just released an updated version which contains a wrapper for the Android VideoView control. VideoView plays videos and will display images using the native Android control. It is based on a SurfaceView. DPF includes a VideoView demo that shows how to use it. It is pretty simple right now with a one line Play() function in the demo which will play a remote video file from HTTP. This simple example is still pretty powerful because you don’t have to download and buffer or store the video yourself. It seemlessly plays a video off the web via a URL. The Android help page claims VideoView also does scaling and tinting for video viewing. 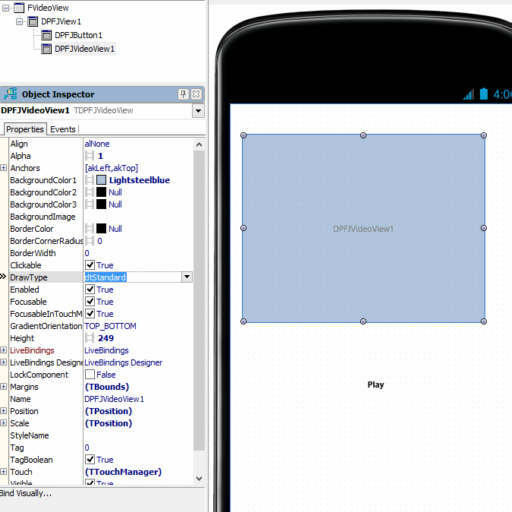 The DPF component suite for Android has a lot of other components and is a must have framework if you’re building Delphi Firemonkey apps for Android. The whole suite is free and available on Sourceforge. Update: Anyone else able to get the VideoView working? I tried loading MP4, PNG, and JPEG and wasn’t able to get anything. Download the full DPF Android suite and try out the VideoView. Does the components support playing a video file from the apps own local directory?